On Tuesday, August 6th, 2018, Tesla stock closed the trading day at $341.99. 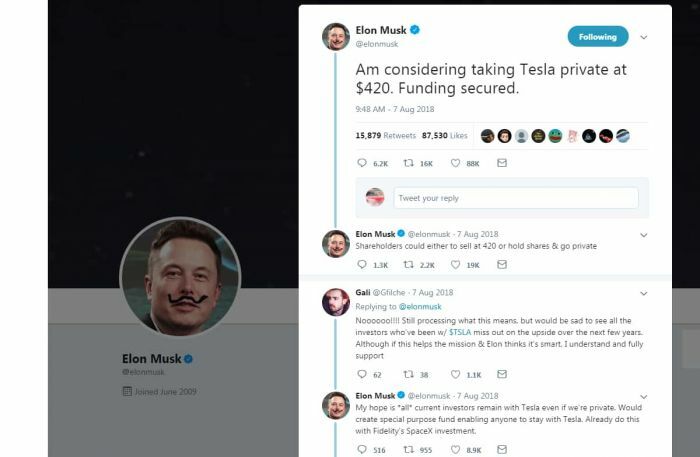 The following morning of August 7th at 9:48 am, Elon Musk posted his now infamous tweet, saying, "Am considering taking Tesla private at $420. Funding secured." As of this morning, Tesla's stock is trading below $270 per share and if the current trend continues could pass below the Tesla 12-month low and touch $240. We have since learned that Elon Musk did not have the "funding secured." That is not the worst of it. What most Tesla fans gloss over is that the funding Musk had been working hard to secure was oil money. Money earned from the production of fossil fuels and being greenwashed by the Saudi government. Elon Musk was trying to sell a substantial part of the electric vehicle company whose mission is to "...accelerate the world's transition to sustainable energy..." to the group that is the antithesis of that goal. The Model 3 finally emerged from "production hell." Tesla was "weeks from death" less than one year ago according to Elon Musk, but survived. Tesla has expanded its sales into other global markets. Tesla survived a cash-depleting bond payment caused by its low stock price. Tesla has now shown off its next big thing, the Model Y crossover. And yet, despite all of these achievements, the stock is not trading at $420. Nor is the stock trading at the same point it was the day before the announcement. Nor is the stock trading at the same level it was one year ago today ($313.56). In October of 2018 Musk was asked on Twitter how he felt about his "$420" tweet in the context of Twitter criticisms and likes. Musk replied it was "worth it." If you are an investor, do you feel that Musk's "420" tweet and attempt to sell a large part of the company to big oil was worth it? Author Note: The author has never owned, "shorted," or traded Tesla stock, nor does he have any mutual funds holding Tesla stock. He also does not gamble or light his campfires with $100 bills.